Binatone is a company traditionally known for its home phone products. 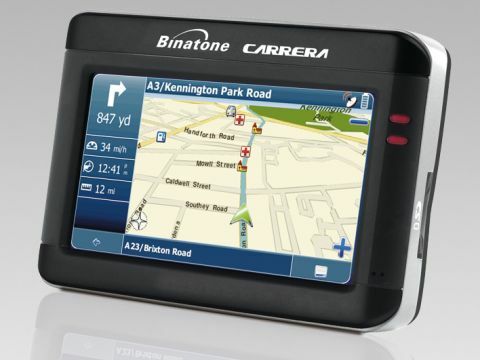 After making a move into the satellite navigation market, the Carerra X430 (£160 inc. VAT) is its first product. It's an entry-level device, aiming to provide all you need without any extras. This keeps the price low, but means you'll have to go without luxuries such as Bluetooth and traffic updates. It's controlled by its 4.3-inch touchscreen, with the only hardware button activating the power. The screen was bright and easy to see in most conditions, and we found the onscreen buttons and menus large and easy to use. Build quality is impressive and, with a rubberised finish, the Carerra felt both tactile and sturdy to the touch. Despite the large screen, the device itself measures just 20mm in depth, making it easy to slip into your bag . The unit started quickly, and we found satellites were also located rapidly. The Carerra supports addresses and full postcodes, along with a comprehensive Points of Interest (POI) list. Mapping for the UK and Ireland is provided by Navteq. We found it clear and easy to follow, with both 2D and 3D maps available. In the latter, it zooms out when you pick up speed, making it easier to see the directions coming up. When we strayed off the chosen route, it was quick to re-route us, and the audio directions were equally easy to follow. For those who find maps confusing, an arrow-only mode is provided, simply pointing out the direction of the next turn. A robust and easy-to-adjust cradle is provided, and we found it attached to our window with no problems. It is slightly large if you want to take it out of your car with you, however. If you're in the market for a cheap GPS unit, the Binatone Carerra X430 is well worth a look. It may lack some of the features found on rivals, but it's stylish, well made and easy to use.